My primary machine is a Commodore Amiga 4000. It used to have a Motorola 68EC030 as its engine; no more -- 68060 now. It's a lovely piece of work with some serious design flaws, but I love it all the same -- mainly for the AmigaDOS. Actually, the quality of the software is a big draw too; there's not much and it doesn't have the flash of the newer PC titles, but it works, and well. Currently it's got a Multiface 3 I/O card, a Cybervision 64, a Hydra ethernet card and a 4091 SCSI 2 controller. It used to have an Emplant Deluxe card (does Macintosh and PC emulations) but it conflicted with the Hydra and so I sold it. It's also now sporting a Phase 5 Cyberstorm 060 which makes it one of the fastest non-PPC Amigas out there. Admittedly that's rather like saying it's the fastest donkey in a stable full of racehorses but it certainly still pulls its weight. User modifications included adding an 68881 maths coprocessor to the old 68030 daughterboard and adding some serious memory to the machine, as well as a grossly huge harddrive - at least by Amiga standards. I also have a six pack changer sitting around, but haven't got the BBS machine (below) using it yet. Screen output is via the Phase 5 Cybervision 64 using a Mag Innovision DX17T with a 0.25 dot pitch. It looks gorgeous although the colours are a little flat. Old 15KHz support is through an extremely hot running flicker fixer using the CV64's passthrough. 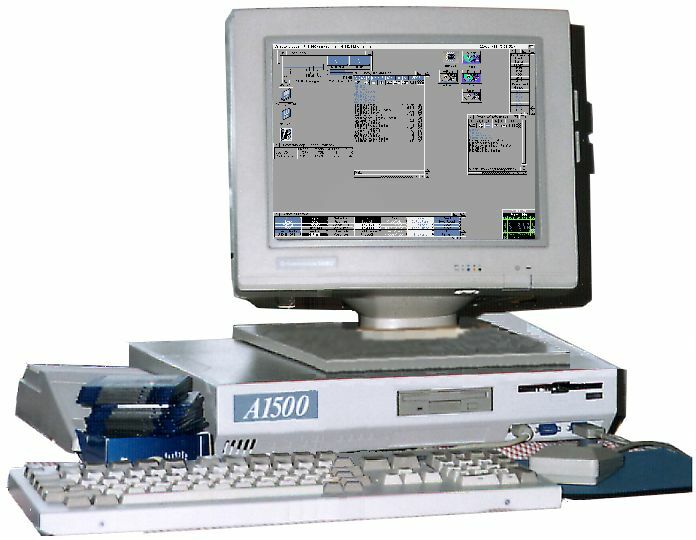 I used to have an older Amiga 2000 which ran my BBS, Flash in the Pan. The software used last was Excelsior! 1.21j and I was planning on switching to Zeus. 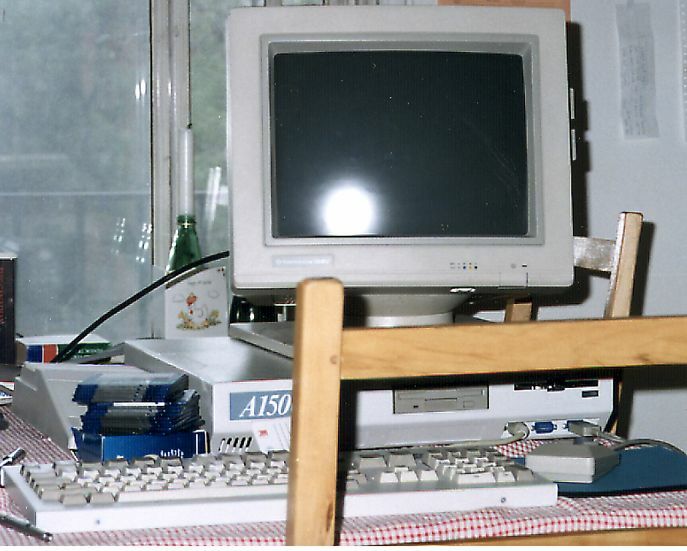 However, since the internet killed off the BBS scene in no uncertain fashion, I've since given away the A2000. While it was around it did have a Multiface 2, another Hydra Ethernet card and an old GVP Series 2 HD+8 SCSI/Hardrive/Memory board. For what it's worth, the 105 meg Quantum the BBS uses arrived with my original GVP A500+ controller back in 1990 and it still going strong. The processor is a Microbotics VXL-030 accelerator board with the 2 VXL-RAM board with 2 megabytes of 32 bit memory and the Kickstart 2.04 ROM. The monitor on the BBS machine is an old Commodore 1902A (intended for the C64!) which I picked up because it was cheap. It doesn't currently have an analogue input to I ran it as an EGA digital monitor -- this does wierd things to colours, believe me. Modems on the system were a USR Sportster v34 28.8, a Supra 14.4LC and a Supra 14.4 (with that nifty LED panel.) The 2000 also inherited an internal drive from my A500 when that died. 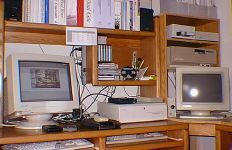 I used IAM's Envoy peer to peer networking software to share files between the two computers and all their peripherals. It was quite useful to let me me grab data off the 4000 when I'm not at home. Here's a listing of the software I use. You might find something that fits your needs! IAM is now dead although the Envoy software continues to be developed. I'll put a link up one of these days, but with only one Amiga, its value to me is now rather limited. An earlier machine I used to have was an A500 rebundled into a Checkmate Digital A1500 case. Unlike the Commodore 1500 (which was basically a 2000 with two disk drives and not much else) this has was a new box with a separate keyboard. I also had a Microway Flicker Fixer hacked into the case. Checkmate was supposed to produce what they referred to as any "Overrider box" which extended the A500 bus to accept Zorro 2 cards, but it never appeared. For those curious as to why certain parts of the A1500 graphic look a bit wierd, here's the original. All this however is useless if one doesn't actually, well, use it. The Amiga is still my preferred email and news machine, and serves excellently as a creative workstation. With the cable modem connection, many of the shortcomings of the processor are a bit more apparent than over the modem, but the speed is still quite acceptable. As I find the Vaporware software to be of excellent quality, I use their tools extensively for internet related tasks such as IRC and web page development. As they say: l'Amiga est mort; vive l' Amiga! Return to the main page. This page was last updated on the 9th of June, 2000.